“I leave with my heart full and head held high,” Selway said in a tweet. “To clients, industry colleagues, and friends, I wish you well – and will see you soon,” he added. 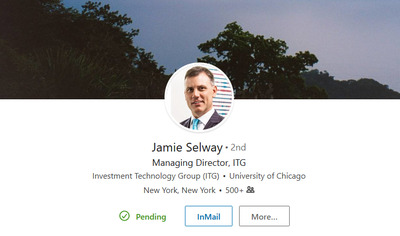 Selway, according to a report by the Wall Street Journal, brought evidence of another executive’s involvement in the program to internal company lawyers in 2010. Outside lawyers were later brought in to review the program. Robert Gasser, who was chief executive of the company from 2006 to 2015, was fired after the external investigation found he kept information from ITG’s board, the Journal reported.